16814.8 Alpheus 6 BIGELOW , son of Roger 5 ( Joseph 4 jr, Joseph 3 sr, Joshua 2, John 1), and Mary (CHILD) BIGELOW was born 04 August 1789 in Winchendon, Worcester co, MA. Following his father's death in 1801, most of the family removed to Weybridge, Addison co, VT, but some of the family later migrated to St Lawrence co, NY. Alpheus married on 21 September 1813 Eleanor WRIGHT, daughter of Silas and Eleanor (GOODALE) WRIGHT and sister of Silas WRIGHT, Governor of New York. She was born 22 September 1792 at Amherst, MA. They settled in Weybridge, VT where Alpheus died 08 June 1833. His death was reported in a letter written by Gov Silas Wright to his parents. Alpheus is buried at the Weybridge Hill cemetery, on Lot 105. His wife Eleanor moved to Canton, St. Lawrence co, NY after his death to live with her son. She died 21 March 1876 at Canton (see stone below), outliving Alpheus by over forty years. The couple had but three sons. 16814.81 Horace, b 27 May 1815; died 16 Feb or 15 Aug 1837; buried with his father. 16814.82t Paul Wright, a twin, b 23 June 1818; m (1) Lydia WESTCOTT, and (2) Rhoda SHAW. It is thought he is the Paul BIGELOW referred to in the autobiography of Lyman Goodale BIGELOW (see Forge, Vol 8, No 3 pg 49). Paul had one son, Rollin, the family "black sheep", who in 1890 was living in Bozeman, MT. Paul listed in Canton, NY Business directory 1873-1874: "Bigelow, Paul W., Canton, Farmer, , Park Street"
16814.83t Silas Wright, twin, born 23 June 1818; d 9 June 1860 Canton, St. Lawrence co, NY (see below); m (1) Alice WHITE, and after her death (2) Ann CHAPPEL, who after Silas Bigelow's death, married Pliney WRIGHT. Silas had two sons that died young. research of Mary Ruth (Reynolds) Judd. son of Roger and Mary. I am a descendant of his brother Samuel. 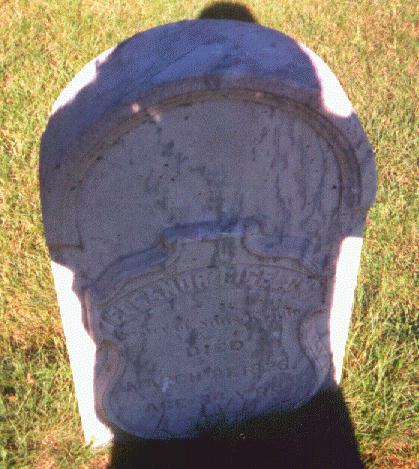 This is headstone of Eleanor (Wright) Bigelow in Canton, NY. She was sister to Governor Silas Wright and wife of Alpheus 6 Bigelow.